Karate Master - Knock Down Blow is a PC action game that represents the art of Kakuto Karate (knockdown karate / full contact karate). It provides many training system to practice any karate action such as punch and kick and combinations of them. 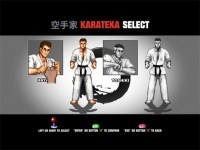 Choose the best karateka player, train him, and be prepared for tournaments. Win the competition by knocking the opponents down. Change the default language to English from the 'Options - Language' menu. This game is played with gamepad/joystick. In order to play using keyboard, you must first assign the keyboard keys by accessing the menu: 'Options - Keyboard Config - P1 Key Config'.